When overbooked schedules leave you feeling dull, create an experience that re-inspires. Relax under the stars with a spouse, host a family movie night and more. 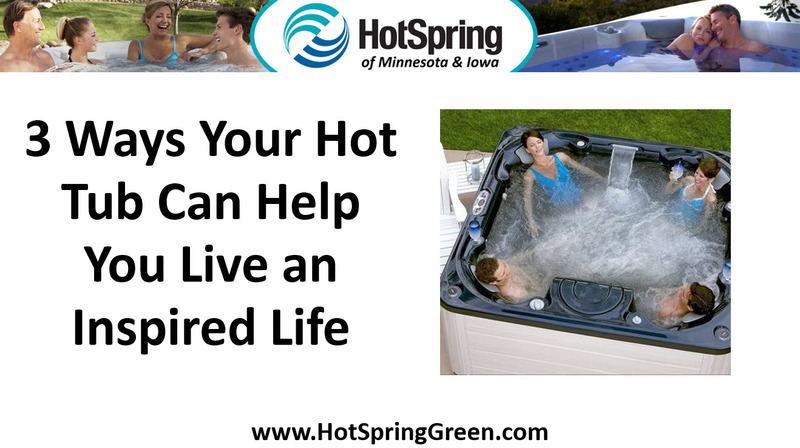 Here are three ways your hot tub can help you live an inspired life. Quality Time With Loved Ones In a world of digital devices, hectic schedules, and scattered families, quality time spent with loved ones is a precious commodity. Take a break to love, laugh, and bond in the spa. Play games or watch a favorite movie, and reconnect for a more inspired and focused you. Soothe Away Pain for an Active Life When chronic pain steals you away from the people you love, inspiration is tough to find. Settle into a heated, massaging hot tub to get pain under control. Let streams of water dissolve muscle and join tension as you relax in easy comfort. All-Day Inspiration Your day may be challenging, but a rewarding soak in your hot tub keeps you striving for strong performance all day. Melt away challenges and focus on the moment, the stars and a deep night’s sleep ahead. To learn more about the benefits of owning a hot tub, pick up a copy of our free hot tub buyer’s guide, 7 Critical Questions You Must Ask Before You Buy a Hot Tub. Just give us a call at 515-270-8702.